If you've been invited to summer barbecue or picnic, don't even think about going to someone Else's house looking like you dress like you don't care. Just because it's a casual environment does not mean that you should not look great. You're going to need some casual short sets from ContempoSuits to look your very best, because let's face it, style does count. 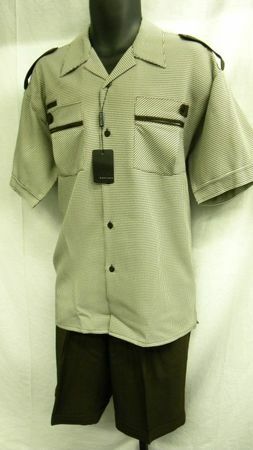 This causal brown and cream houndstooth pattern short set comes with trimmed pockets and epaulets on the shirt and solid color shorts that are knee length and are cuffed on the bottom. Fabric is a soft touch 100% Poly.